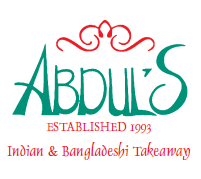 Welcome to Abduls Takeaway, one of the finest Indian & Bangladeshi Takeaways in Edinburgh. We have been delivering delicious hot takeaway food to our local clientele for over 15 years. Abduls always strive to bring you the best QUALITY, PRICE and SERVICE, whilst our world class chef is always searching for new ideas and ingredients to add that touch of magic to our dishes. Testament to our success is our loyal customers who have ordered week in week out for over a decade. We are proud of the dishes served from our kitchen yet we are always humble enough to listen to our customers and value your feedback enormously. Please be sure to rate / review us. In tune with 21st century technology we offer an ONLINE ORDERING SERVICE. You can pay by cash as normal or card which saves you running to the ATM. The management of Abduls would like to thank you for your continued custom. IF YOU LIKE US TELL YOUR FRIENDS, IF NOT THEN TELL US ! !